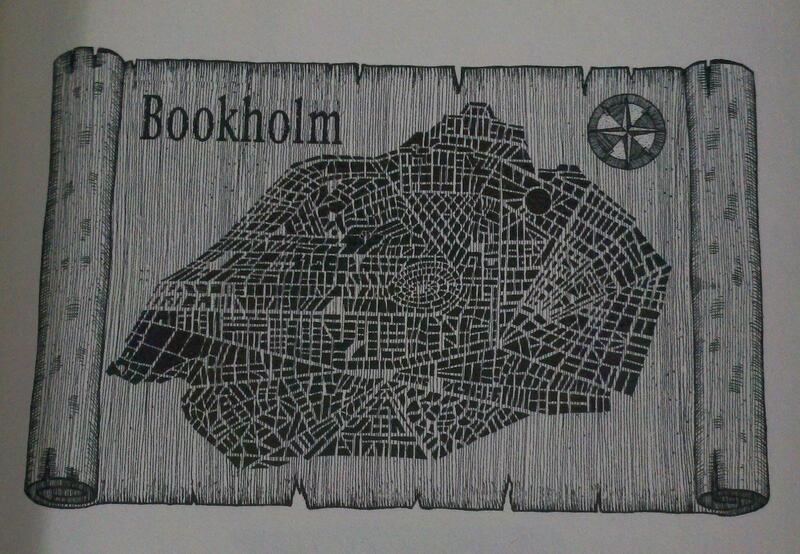 Both The City and The Labyrinth of Dreaming Books take place in and below the city of Bookholm. Sometimes I think Moers and his readers love the idea of a city where books are prized above all else as much (or even MORE) than the stories he’s built around it. So what better way to celebrate the latest edition to the Zamonia series than to quote a few excerpts from the yet unpublished Lonely Lindworm’s Guide to Bookholm (on a shoestring)? Bookholm – known throughout Zamonia as the City of Dreaming Books – is located where the Dullsgard Plateau and the Demerara Desert converge. Hundreds of years old, this once quaint hamlet of bookshop-lined streets has grown into a virtual megalopolis of bookish goodness. Its borders have expanded horizontally and soared vertically. (The city now boasts several 3-5 story structures and quite a few aerial libraries). It is true that neighborhoods which were abandoned after the Great Conflageration of Bookholm – such as Darkman Street – have become toxic no-mans lands where you can die in several horrible scenarios (breathing in poisoned gas or being eaten by giant mutated animals to name two). But in other areas of the city new and bustling districts have emerged. Travelers who want to experience the “true” Bookholm should be careful not to limit themselves to the tourist traps of The Borderlanes, but instead take the time to really explore the inner rings of the city. Get to know the locals. Bookholm’s population (individual citizens of which are referred to as Bookholmers) is as varied and diverse as the books the city walls contain. Murkholmers, Lindworms, Ugglies, Wolpertings, Dwarves, Vulpheads, Nocturnomaths, Shark Grubs, Moomies and Gnomes (to name just a few) all coexist… or at the very least mutually tolerate each other. Most residents appear to speak a common language and the city is very visitor friendly. Not surprising, as biblio-tourism is its largest industry. While the obvious draw for tourists to Bookholm are its 5,000+ antiquarian bookshops, the city also has a long and rich tradition in the performing arts. Timber-Time was for centuries a favorite among residents and visitors alike. But who wouldn’t revel in a chance to hear the great works of Zamonian literature recited by Master Readers? Sadly, in recent years this folksy custom has fallen out of favor and a Timber-Time reading in Bookholm has become as rare as a crat in Malaisea. Yet the offerings of this wonderous city go beyond that which is strictly literary in nature. Prior to the Great Conflagration Trombophone Concerts (performed by Murkholmers on an instrument fashioned from a Trombophone shellfish found only on the western shores of Zamonia) were all the rage. Those who had the great fortune (and, sadly, the misfortune) of attending a concert describe the music as “charming”, “ethereal and melodious”, and as inducing incredible visions. Trombophone Concerts, probably due to their being a Bookemist plot to overthrow the city and enslave its inhabitants, have long since gone the way of Timber-Time. But their hallucinatory properties are fondly remembered. For more information on Trombophone Concerts, the Great Conflagration and Bookemists, we recommend consulting Optimus Yarnspinner’s The City of Dreaming Books. In the 200 years since Bookholm went up in flames things have changed – so it’s not surprising that some of those changes have extended into the realm of the performing arts. The most significant development has been the emergence of the various forms of puppetry. The pinnacle of this discipline can be witnessed at the Puppetocircus Maximus (picture the Cirque du Soleil of puppet theaters) – created and managed by the mysterious artist and innovator Maestro Corodiak. And while a performance at the Puppetocircus Maximus is a must-see, there are also hundreds small theaters spread throughout the city, of varying disciplines and quality, to be explored. For those budget-minded travelers, we heartily recommend Arial Puppetism “an extremely artistic spectacle whose aerial athleticism is at least as worth seeing as the plays themselves” in which puppets take to the skies. All performances are funded by the municipality and free to the public. Or, bringing things closer to the ground, there is The Microscopic Theatre of the Absent Teenies (located on Arlis Worcell Street) – a delightful spectacle on a much smaller scale. The bloodthirsty with a historical fetish should attend at least one marshal performance of Blood Theatre. And for those interested in learning more of the Bookholmian Puppetry a visit to the Nocturnal Market is advised. It’s the best place in Bookholm to experience the cutting edge of this new and fascinating art form. Bookholm has a whole range of other attractions, catering to every interest. For foodies there are Zamonian delicacies such as Bee-Bread and Book Wine to be tasted. For scholars interested in the history of the city and it’s architecture there are walking tours with Live Historical Newspapers “All in Gothic!”. These gnomes covered in strips of newsprint evolved out of the Live Newspapers (tabloids, really) of old Bookholm and are the very same as used by Optimus Yarnspinner, himself, on his visits to this fair city. 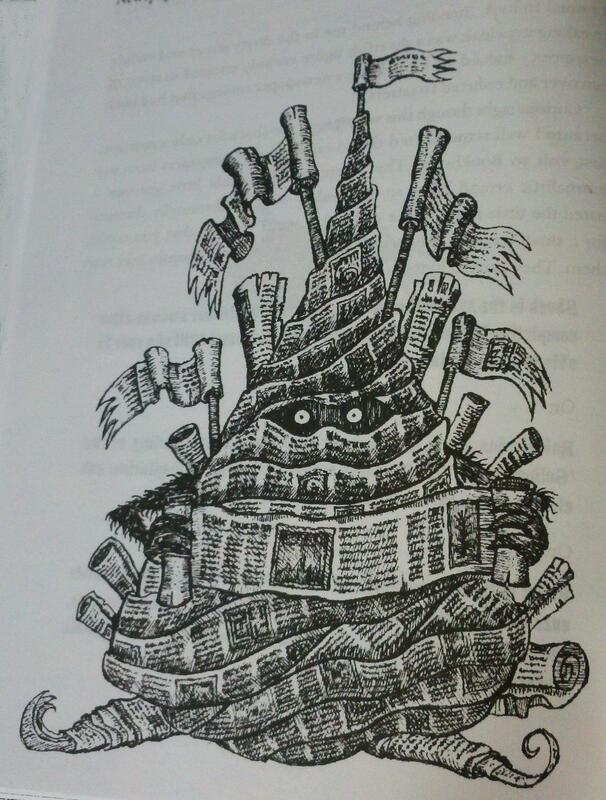 (Word of caution: Live Historical Newspapers have been known to swarm). To fully experience the riches of Bookholm we suggest consulting the works of the greatest of Zamonian authors: Optimus Yarnspinner. The City of Dreaming Books and The Labyrinth of Dreaming Books are essential reading for any traveler. Both books have been made accessible to the general reading public thanks to the work of the famed translator Walter Moers. Other recommendations (though not as widely available) are Colophonius Regenschein’s The Catacombs of Bookholm and Ovidios Versewhetter’s The Miracle of the Graveyard of Forgotten Writers. And be sure to visit SJ at her blog Book Snobbery tomorrow for the next stop on the tour. The Dreaming Books Blog Tour Begins! 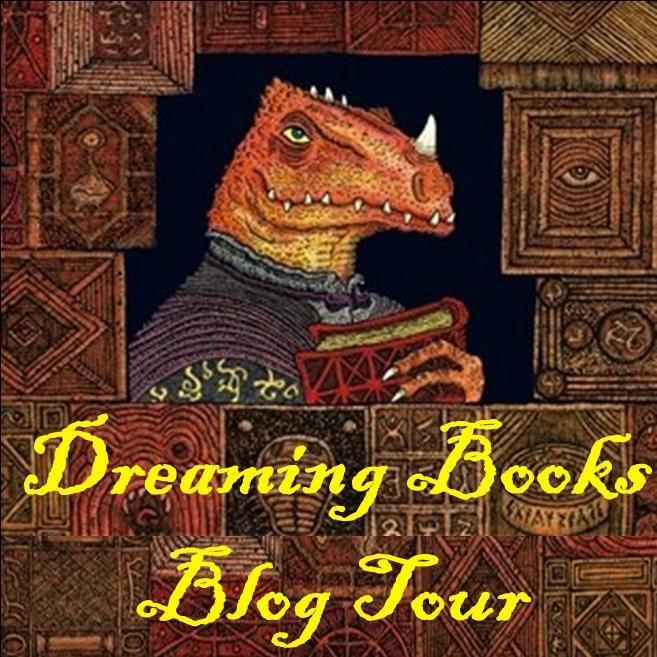 Welcome to The Dreaming Books Blog Tour! A Book Blog Tour celebrating the writings of that legendary lindworm* Optimus Yarnspinner, his German translator Walter Moers and his English translator John Brownjohn. The occasion is nothing less than the publication (FINALLY!) of the English translation of Yarnspinner’s masterpiece: The Labyrinth of Dreaming Books. For some of you, my fellow bibliophiles, the release of The Labyrinth of Dreaming Books (which marks the beginning of Yarnspinner’s Purple Period and chronicles his return to the city Bookholm) has been eagerly – dare I say impatiently? – anticipated. For other lucky readers it is an opportunity – an impetus really – to begin their exploration of Zamonia and a chance to read for the first time the great lindworm’s earlier, Orm** inspired, novels. Such as The City of Dreaming Books in which he tells of the story of his hair-raising, youthful adventures within the catacombs beneath Bookholm. Or, for those interested in the less biographical works, The Alchemaster’s Apprentice: A Culinary Tale from Zamonia. But, before I go on, the Zamonian virgin should know that these are far from typical stories. In the words of Yarnspinner, himself, I feel it’s only fair to warn you. Yes, I speak of a place where reading can drive people insane. Where books may injure and poison them – indeed, even kill them. Only those who are thoroughly prepared to take such risks in order to read this book – only those willing to hazard their lives in so doing – should accompany me to the next paragraph. The remainder I congratulate on their wise but yellow-bellied decision to stay behind. Farewell, you cowards! I wish you a long and boring life, and, on that note, bid you goodbye! And make sure you stop at Overlook Press’ the Wingéd Elephant blog on November 8th to enter into a Special Secret Giveaway…. so secret that even the bloggers don’t know what it’s going to be for! So prepare yourselves for a 7 day immersion into all things Zamonian. This, fellow readers, is where our book tour begins! *Lindworms are Zamonian dinosaurs who make their home on a mountain called Lindworm Castle. During the course of their evolution they discovered that – as a species – they possessed a literary and artistic nature. The result has been that Lindworms are some of the most celebrated writers and poets in Zamonian literature (particularly amongst themselves). “ ‘As the Lindworm’s mental powers steadily developed, so their savage, dinosaurian instincts withered away. Having hitherto communicated in a mixture of grunts and sign language, they learnt Zamonian from the farmers and traders who they came into contact with. Later, they began to record their words and thoughts in writing. Language was one of their principal pleasures. They took to speaking in rhyme, wore long robes and elaborate jewellery. They. . . Well, they became artists, you understand? Artists and poets!’ Rumo stared at Smyke uncomprehendingly. ‘No, you don’t understand – no normal living creature could, but never mind. They liked to regard themselves as something special. Because they could write poetry, they thought their sweat smelt like perfume…’” (Volzotan Smyke, Shark Grub, from Rumo & His Miraculous Adventures, pg. 44). ***The opinions expressed regarding camomile tea are Yarnspinner’s alone and do not represent those of Overlook Press or any of the bloggers participating in the tour. This blogger, in particular, has no strong opinions (and makes no judgements) regarding camomile tea or those who quaff it.